It’s half way through the year and time to take a step back and look at the year so far. Which regions have been the winners and losers? Which now look over/under-valued, including which have the strongest discounts? What has driven markets? What news events have had the biggest impact on each area? Perhaps most importantly, which areas now look like the strongest areas for investment, particularly through investment trusts? Managers from each different region slug it out for the hearts and minds of investors. 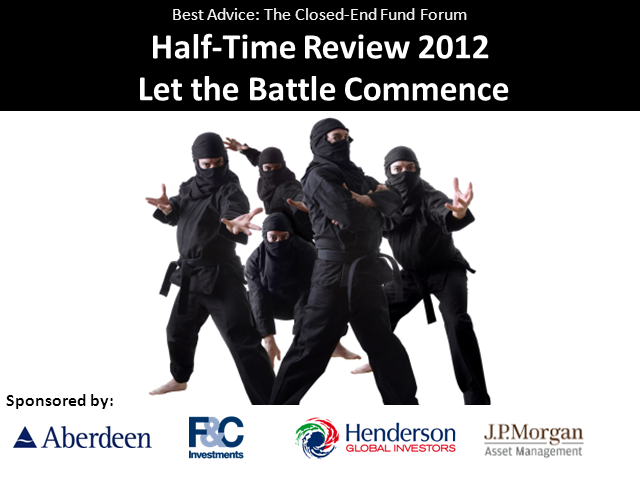 Fees have come down, performance has once again been ahead of the open-ended sector and fund raising has been buoyant. We discuss the year in investment trusts, whether the sector is finally seeing the much-anticipated RDR bounce and whether some of the issues of investment trusts - such as the fund supermarket problem - are closer to a resolution. The investment trust universe is becoming more diverse, enabling investors to incorporate some interesting and non-correlated assets into their portfolios. Among the trusts now available are litigation funds, floating rate note funds, loan funds, and diverse property trusts. Which have performed best? Which have proved to be a genuinely uncorrelated source of returns? Where do these alternatives funds fit in a portfolio? Much has been written and spoken about with regard to European elections, particularly in Germany. What will our expert panel make of the results, so far? What implications do they believe these results have for investors going forward into 2014? This session is intended to help advisers understand the issues and challenges of new political landscapes in Europe and how it may impact on investment decisions. We will discuss and try to answer questions that may be of concern and relevance to you, the adviser. We review the latest developments in investment trusts - new launches, new issuance, funds closing and restructuring. We look at the bull and bear cases for the different trusts - and how they can serve a range of investor needs - income, diversity, growth. The panel will also broaden this out into a wider discussion of the current market environment and how new issuance meets the needs of that environment - for example, the spike in bond yields, or the improving equity markets. Why is it important to diversify an income portfolio? What are the challenges of income in a low interest rate environment? Is this likely to change? How is the investment trust industry adapting to investors' income needs? The investment trusts sector offers an increasingly wide range of options to build an income portfolio, including property, infrastructure and emerging market debt in this panel session the speakers explore all the options at your disposal. • Is there still value in equity markets and if so, where? • What will be the key pinch points for the markets in the second half? • Which trusts are best equipped to generate strong returns in that environment? The investment trust industry is changing: Routes to market are becoming more effective, and platforms more receptive; charging structures are improving; discount mechanisms are modernising; and the structures of trusts themselves are changing. We talk about some of the innovations in the sector, analyse new launches and show how it is meeting the needs of investors. • Whether history does repeat itself, or merely rhyme? • What have been the hardest markets to negotiate? Complexity? Gearing? Lack of research? Platform pricing? Liquidity? Poor administration? We address some of the major issues and propose solutions in a live panel session where advisers will have the opportunity to question the experts on using investment trusts, asking them difficult questions on the structure. We also look at the knowledge requirements on investment trusts for advisers. For advisers to remain independent, they must now having a working knowledge of investment trusts. A panel of financial advisers discuss how they approach investment trust due diligence, manage liquidity and handle discounts. This offers an opportunity for advisers to understand how their peer group approach investment selection and regulatory obligations in regard to investment trusts. In this live session a panel of experts will discuss the mood among investment trust managers/investors at the start of 2013 and asset allocation positioning. Where are the best opportunities to be found? Are there any areas likely to offer the seductive mix of rising asset values and narrowing discounts? Conversely, which areas of the market now look fully valued and may struggle in 2013? The experts will share their views on the best investment opportunities for the year and how investment trusts can be used to take advantage. A panel of investment trust experts answer your questions on everything from gearing, to risk management, to investment performance. The session will also cover developments in the industry in 2012. - Francis Klonowski, Klonowski & Co.
Investment trusts have some natural advantages: they can use gearing to maximise their exposure to a rising market and they can reserve income in stronger years to distribute in weaker years, for example. This makes them naturally suited to certain types of assets and markets. We will discuss the areas best-suited to investment trusts and why. For example, it might be UK for income or emerging markets for growth. In the interests of objectivity, we will also discuss the markets where investment trusts do not work as well. The discussion will also include a comparison with UCITS III and non-UCITS funds, the different type of powers they have, and where they might be more appropriate. Multi-asset portfolios are the latest buzz-word in investment. They promise lower volatility with a smoother return profile than standard equity funds. Investment trusts offer all the tools to build a multi-asset portfolio, but often at lower cost and with less complexity. This session will explore how investors might go about building or enhancing a multi-asset portfolio with investment trusts. What types of assets are available? How can investors judge correlation? Where can they find true diversity? How can investors blend open-ended and closed-ended to ensure diversification? Gearing is often presented as a stumbling block in investment trust due diligence. It can be difficult to pigeon-hole a trust into a certain risk category when gearing can range significantly, for example. This can be addressed with a proper understanding of gearing – different investment trusts use different types and with that comes different risks. The session will cover: The different types of gearing used; the markets in which it has been particularly effective; how the decision is made; how investors can analyse gearing; how geared investment trusts can be incorporated into traditional risk models. Advisers have traditionally been put off investment trusts by perceived complexity. In reality, closed-ended funds are no more complex than open-ended, but it is worth examining the ‘tricks of the trade’ and how expert investors in investment trusts manage the quirks of investment trusts, notably discounts, liquidity and governance. Investors will also talk through where they use investment trusts and where open-ended funds might be more appropriate. One of the key advantages of an investment trust is the ability to manage illiquid assets. This session looks at the arguments for non-conventional investment trusts, such as diversification, return potential and accessing faster growth or higher income. It will also consider the discount problem – a particular issue with illiquid investment trusts – and how investors can manage it. The speakers will uncover why the investment trust structure works well for these types of asset classes. Platforms are providing better access to investment trusts but there are a number of things to consider when buying through a platform such as pricing, costs, choice and timing. This session will look at how buying through the different platforms compares and where may be the best places to buy. It will also look at platforms that incorporate investment trusts into asset allocation model portfolios and how platforms can help the selection process of investment trusts. Andrew Neil and Fraser Nelson. The impact of Budget 2012 on Britain's economic and political future. Regular online events for stockbrokers featuring news, views and education from a variety of leading industry fund managers and professional investors.